Murder Mystery Party Games and More! AFTER NEARLY 20 YEARS, MYSTERIES BY VINCENT DECIDED TO CLOSE THEIR ONLINE STORE IN MARCH 2014. WE WILL BE SELLING LOCALLY, IN THE GREATER HOUSTON AREA, AND AT SELECT SHOWS ONLY. Murder mystery parties are our specialty. Our murder mystery dinner party games make it simple for you to entertain inexpensively at home! Because our mystery party games come in boxes, they also make excellent and unique Christmas presents. Each of our games include complete instructions, so even first-time hosts can easily put on a mystery party that will provide your guests with a wonderfully, memorable evening. Especially since, at Mysteries by Vincent, we like to make mystery party entertaining so that . . . IT'S EASY. That's why we offer a wide range of mystery party products, from murder mystery games for 8 and 10 players, to our murder mystery party games for women only, as well as our children's mystery party games - the Daisy Diamond Detective Series for pre-teen girls - and finally, our murder mystery Skit-kits(tm) for large parties and fundraisers. Some of our mystery games can be hosted in a heartbeat. But if you'd like to put on a more elaborate party, we've got murder mystery dinner party games for that, too. Our murder mystery games come in boxes, with invitations, character booklets, complete instructions and clues included. offer our "Laugh or your money back" guarantee. "I LOVE your mystery games! Your wit and humor is the best. I don't want to buy mystery dinners from anyone else!" As seen on HGTV's Do It Yourself Network! Check out our new mid-size party kit, set in 1937 A Minor Little Murder or Who Offed the Upper Crust? Or, for a blinged-out option, how about one of our best 10-player dinner party games A Perfectly Perilous Pageant. COPYRIGHT 2011 MYSTERIES BY VINCENT. ALL RIGHTS RESERVED. WEBSITE DESIGN BY WEB CRAFTERS. Since our mystery party games come in boxes, they also make perfect Christmas and holiday presents. Murder mystery games are perfect for holiday parties, graduation parties, most importantly, birthday parties! And our women's murder mystery party games are perfect for wedding showers, baby showers, or a girls night out. Plus, we have some fabulous murder mystery party fundraiser kits, that will guide you step-by-step to hosting your own fundraiser. But mostly, murder mystery parties are just a fabulous way to entertain anytime! 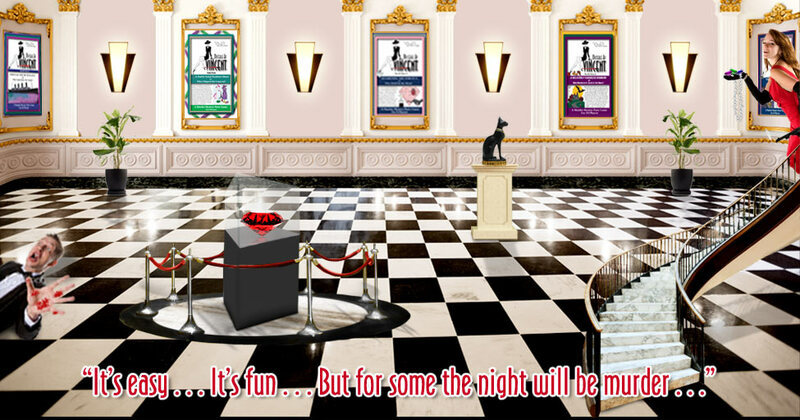 Now step inside and see our murder mystery games, our mystery party Skit-kits and more! Got questions? Comments? Just . . . Email us right here! And, have you tried, Murder on the Millennium, or Who's Killing Time?, one of our signature murder mystery party games yet? If not, Click here! It's the perfect game for New Years Eve!